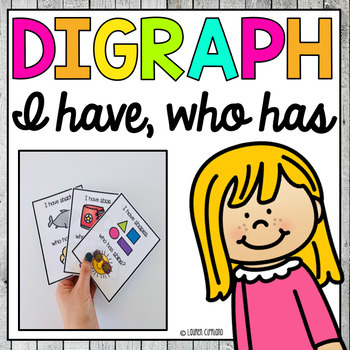 This set of 17 digraph I have who has game helps students learn or practice digraphs. 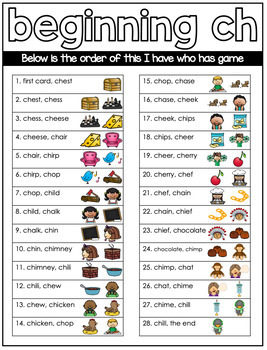 The included digraphs are Ch, Sh, Th, and Wh. - 17 I have who has games. Each game has 28 cards with the exception of the wh game which has 22 cards as words were limited. 1.Distribute one card to each student, then distribute the extras to students at random. 2.As you distribute the cards, encourage students to go over the words on their card in their head. 3.When all cards are distributed, select the student with the starter card to begin. Players will continue reading the cards in order. 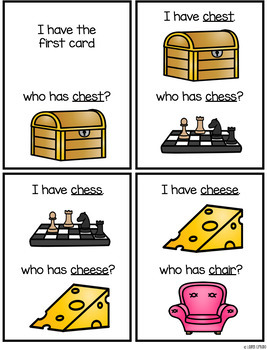 Example “I have the first card, who has shark?”. ”I have shark, who has shell?”. 4.Play ends with the "end" card which says “the game is over”. 5.After the class is comfortable with this game format, consider using a stopwatch to time the class game. Record the time on the board so that students try each game to beat their current best time. This practice encourages students to stay attentive and prompts students to learn the words so that the class time improves. -Prior to the students using this activity, you will just need to print out the game cards, laminate them for added durability, then cut them out along the lines. 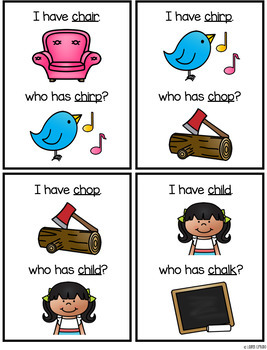 Check out my other digraph items by clicking the link here.